Here we have it folks the next advancement in USB technology. It's still USB 3.0, but the Promoter Group announced that it's now SuperSpeed USB. 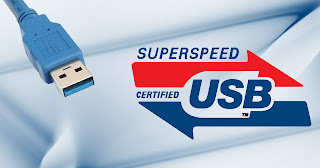 Well more specifically SuperSpeed is an enhancement of USB 3.0 that adds "much higher data rate, delivering up to twice the data through-put performance of existing SuperSpeed USB over enhanced, fully backward compatible USB connectors and cables." This work will probably be finished by half way through the year and you'll be able to get "10Gbps data rates, improved data encoding for more efficient data transfer, and compatibility with existing 5Gbps hubs and devices (and even USB 2.0 products)." At the moment the only thing missing is some kit which can work with the standard, but there's still the rest of the week for that to turn up!